Archaeological consultant Professor E. Steemed has been asked to date a cache of Roman coins in Jerusalem. In the cache is an example of every coin ever minted by the Roman Empire. There are no dates on the coins. 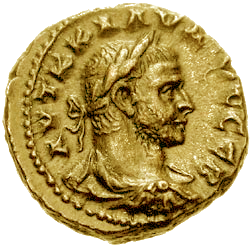 Instead, they bear the face of the Roman ruler during whose reign the coin was minted. The coins span the time from about 300 B.C.E. to about 300 C.E. What date did E. Steemed arrive at? Pick the best answer. B) no later than 300 B.C.E. C) no earlier than 300 C.E. Prof Steemed averaged the mid-points of each ruler's reign and arrived at about 1 C.E. Lost? Me, too. 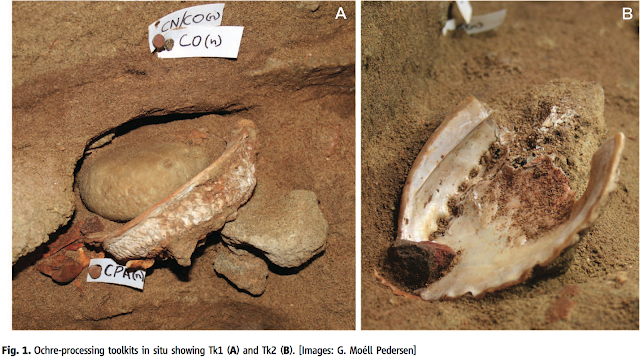 I was similarly lost when I took a look at the background information regarding the Optically Stimulated Luminescence* dates from Blombos Cave, South Africa, published yesterday in Science. Henshilwood et al. have discovered more evidence of modern human behaviour, after previously reporting on shell beads and decorated ochre. This time they have evidence of ochre processing, and two virtually identical 'toolkits' comprising Haliotis shell and traces of dessicated paste or liquid pigment. This discovery wouldn't even have made the South African Journal of Science if not for the claim that these items are 100,000 years old--at least 50,000 years older than the oldest securely dated evidence of this kind from elsewhere in the world! As you might imagine, the Subversive Archaeologist is highly sceptical of claims for the antiquity of modern behaviour that stands out as a temporal anomaly. South Africa seems to be a Bermuda Triangle of temporal anomalies. Modern human skeletal material from Klasies River Mouth is claimed to be about 100 kyr old, along with the modern-looking Howiesons Poort lithic industry that accompanied the remains. And, as I said before, previous claims from Blombos are along the same lines. But until now I haven't bothered to look further into the claims. This seems like as good a time as any. I had a look at the Supplementary Online Material that goes along with yesterday's Science article. In it Henshilwood et al. illuminate the reasoning behind the OSL age determinations. I think you'll have to agree that the data presentation and interpretation are, at best, intriguing, and at worst inscrutable. So, what do we have here? It looks very sophisticated, and in the classical sense, it really resembles sophistry. The above diagram is a tri-axial plot of the data derived from a sample of sand grains taken from the vicinity of the Haliotis shells. The X axis is a standardized estimate of the statistical error of the actual luminescence measurement of this sample, which comprises a large number of single grains of quartz sand assayed individually. 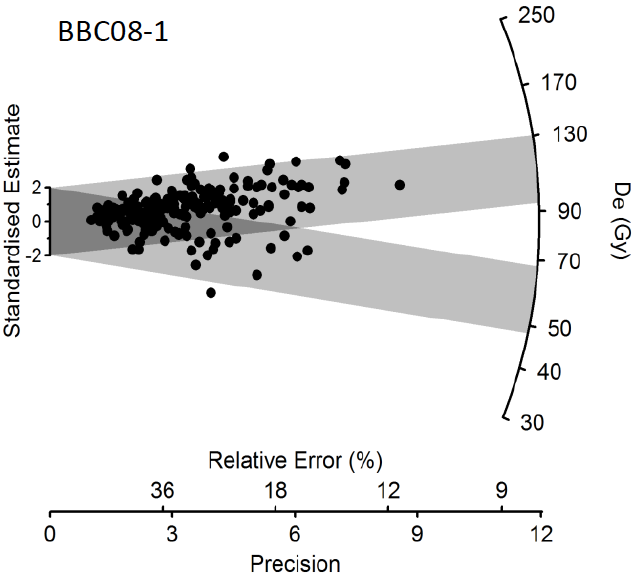 The Y axis is another estimate of error, and its inverse, which is taken to be an estimate of the precision of each datum in the sample. Each dot represents a single grain of sand that was subjected to the luminescence measurement process. The curved scale at the right is the total dose of radiation that is estimated to have been responsible for the degree of luminscence measured for each grain--the greater the luminescence, the older the sand grain is. Note that the scale is in Grays, a measure of absorbed radiation, and that it's not a uniform scale--the intervals of the upper estimates are much smaller than those toward the opposite end. The actual calendar year age estimates are derived by dividing the estimated total dose by the annual dose rate, itself an estimate of the amount of radiation that a sand grain is exposed to during the course of a year for the duration of its time in the deposit, which has been measured using a portable gamma-ray spectrometer. Estimates piled upon estimates multiplied by error margins. Even though the diagram above is just a representation of the mathematics involved in an OSL age determination, it gives an impression of the potential for error inherent in calculating an OSL age in calendar years. Now that I've opened this can of worms, I won't be able to rest until I'm able definitively to critique the claims from Blombas Cave. This means I'll have to read and digest all of the literature referred to in Henshliwood et al., until I'm sure that I understand all of their reasoning, statistical and otherwise. Dang, this is going to be worse than Statistics in Archaeology with Jack Nance! * developed at my alma mater, Simon Fraser University!